Brain–computer interfaces (BCI) are devices which measure brain activity and translate it into messages or commands, thereby opening up many investigation and application possibilities. This book provides keys for understanding and designing these multi-disciplinary interfaces, which require many fields of expertise such as neuroscience, statistics, informatics and psychology. 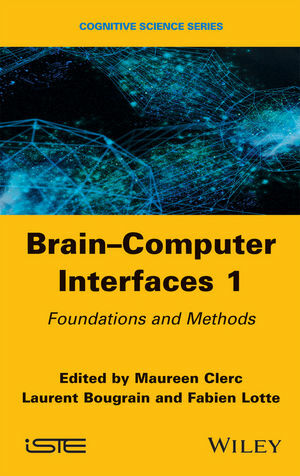 This first volume, Methods and Perspectives, presents all the basic knowledge underlying the working principles of BCI. It opens with the anatomical and physiological organization of the brain, followed by the brain activity involved in BCI, and following with information extraction, which involves signal processing and machine learning methods. BCI usage is then described, from the angle of human learning and human-machine interfaces. The basic notions developed in this reference book are intended to be accessible to all readers interested in BCI, whatever their background. More advanced material is also offered, for readers who want to expand their knowledge in disciplinary fields underlying BCI. Maureen Clerc is Senior Researcher at Inria Sophia Antipolis, France. Laurent Bougrain is Assistant Professor at the University of Lorraine, France. Fabien Lotte is Junior Researcher at Inria Bordeaux, France.